Be of service... DO SOMETHING! Get involved. Get outside of yourself! There is nothing better than giving of yourself. A simple way is to volunteer to do something you like; playing guitar at the “old Folks Home” or working on a city scape mural or helping to build a playground… OR join a Service Learning Project. 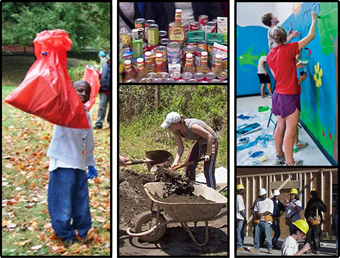 Service Learning is a way for people to become involved in service experiences. These are projects that are usually very cool and meet actual needs in the community. They are often coordinated through a school or community program and can even be a part of your school curriculum (and you get credit!) These projects also help you become familiar with how the community works and what other opportunities exist. Service Learning promotes active citizenship and youth leadership… which simply means you see how important it is for people to be involved in their communities AND you often find great career opportunities. If nothing else… putting service projects on your college or job application gives you points and helps you stand out from the others.